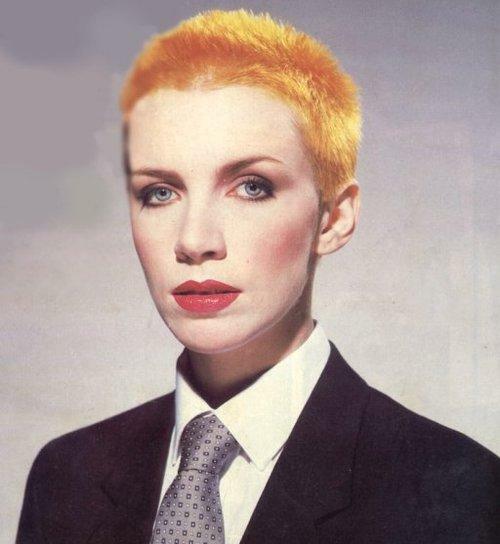 When I was in fourth grade, I had Annie Lennox as a teacher. Well, not really, but her doppelganger. Most middle-school teachers when I was young tended to be slightly dowdy women who wore supportive shoes and cardigans. Mrs. D had short, spiky hair that was cropped so closely you could see the white of her scalp. Her eyes were shadowed in the bright, industrial colors fashionable in the early 1980s, making them look like silvery blue or pink gashes in her pale face. Her cadaverous, wan cheeks were highlighted with blush streaks so obviously artificial they looked like the warpaint of a Hollywood Indian. She was thin, not like a lean, sinewy teenager or a wan dancer, but in a manner that made me wonder if digestion was uncomfortable for her or if she had several of her lower ribs removed. I think this effect was derived from the fact that she wore shoulder pads so large that she could have easily tackled the entire cast of Designing Women, if not blown over by a strong gust of wind first. Mrs. D moonlighted as a model. She also ran a travel agency with her husband when not in school, and had seen most of the destinations popular back then--Rome, Florence, London, Paris, and Bermuda. Despite the terrible, Michel Jackson-inspired zippers and buttons she wore on her jackets that I secretly hated, she was cool. She introduced me to The Mixed-Up Files of Mrs. Basil E. Frankweiler, which she read aloud to the class instead of some morally uplifting tract. In that book, the kids disobeyed grownups and did dangerous things and came out better in the end as a result. Mrs. D also told horrific stories about her personal life, like the time she was washing dishes and sliced open her hand on a sharp knife and because her hand was under water she didn't feel it until the water had turned red. And how her friend didn't drink milk when she was pregnant and when she was playing with the baby, the baby swatted out all of her friends' teeth, because the mother's bones had grown so brittle, so we should all make sure we got enough calcium. She let us name our reading groups anything we wanted (I was one of the arrogantly-named 'Whiz Kids'). When there was a fad for bringing in Cabbage Patch Kids to school, she installed a cardboard house for the dolls rather than banned them. The playhouse reeked of baby powder, but we loved her for that. I had a CPK, even though I found them ugly, and I really only liked them because you could chase the cute boys around holding one and they would flee, because they'd smell like the dolls if you hit them with it. ...Mrs. D asked them to sing the song in front of the class, which gave them the attention they wanted but diluted the subversive power of their performance. I brought in a novel for her to read aloud to the class called The Real Me, after Mrs. Basil was done. I was scared to do so because it was about feminism. Barbara, the heroine of the novel, was everything I wanted to be. She was a girl who had a paper route, and when forced to take slimnastics in school rather than tennis because she was a girl and was slightly overweight, Barbara staged a protest and got to take the sport. She could terrorize the Chow dog that followed her on her bike as she pumped the petals late into the dark fall night. She was what I was not--free, strong, and athletic even though she had to shop in the Pretty Plus section of Sears, like all slightly overweight girls of the Cabbage Patch Era. The class loved the book and some people actually thanked me for selecting it, including some of the guys I whacked with my baby-powder smelling doll. It was the kind of 1970s realistic middle-school fiction that isn't popular anymore, without vampires and dystopian post-apocalyptic realities. The kids were always smarter than the clueless, neurotic grown-ups and the girls rode around on their bikes a lot, ironed their hair, and found birth control and tampons in their older sisters' rooms. You don't really appreciate the annoyance of chicken fat until you cook chicken frequently--or how tasty it can be. This is less of a recipe and more of 'the spices I am currently seasoning my chicken with.' But since it's a little bit unusual and I like the mix so much, I thought I would share it with all of you. 2. Salt the chicken, sprinkle generously with paprika and dried mustard, then blend the thyme, rosemary, and oregano together. Season beneath the skin. I also like to season the top of the thighs, but be aware that the spices may burn and smoke slightly. You may not use all of the seasoning. 3. Bake approximately 1 hour-1 hour 15 minutes. If the chicken is browning too quickly, reduce oven temperature to 400F. The chicken is done until the juices 'run clean' or a meat thermometer reads a temperature of 165F. Serve, if desired, with spicy Dijon mustard. As always, I am thoroughly entranced by your writing. Thank you. Groveling in unworthiness...thank you so much, Carol! I know you are a 'reader' so that means so much to me! The first time I saw schmaltz was on some food show on PBS and I was horrified. Maybe because it was in one of those little pitchers that diners use to hold pancake syrup, so the idea of someone using one to pour cold rendered chicken fat over their lunch struck me as grotesque. Nonetheless, I've been doing a lot of roasted chicken legs lately because they are comforting and make the world seem less horrible and one day I decided to lay the chicken pieces over a bed of potatoes and onions before roasting, and if there is a better potato than one that has been roasted in chicken fat, I don't want to know about it. I don't do the potatoes every time though because having a heart attack before age 50 seems so dissolute. @flurrious--I felt the same way about schmaltz! I loved pancake syrup as a kid (and the pancakes that came with them) so the idea of room-temperature chicken fat in one of those cute pitchers sounded revolting. But chicken with skin is so much better than 'naked' chicken or (shudder) boneless, skinless chicken breasts. Cauliflower is a delicious substitute for white potatoes and a great 'fat absorber,' and I often have it with chicken. @Julie--Thank you so much! Glad things are going so well for you, too! Great post. Your "cool teacher" reminds me of one of my own that unfortunately didn't show up until high school. She was fresh out of teachers college and turned the curriculum on it's head by challenging us to be creative in a way that was completely outside of the norm. I feel like I've written about her on my blog before, but would have to go back to make sure. I owe her that much :). Oh and the chicken looks great. Skin and all. As much as it might be a sin to speak of such things, I still fondly remember (and probably would still enjoy) pealing the skin off of KFC chicken and savouring every deliciously greasy bite ... mmmmmmm... :). @Adam--my teachers have had a tremendous influence upon my life. The relationship between teacher and pupil is really a very long and intimate one. They get 'in your head' for a large portion of your day, especially in the lower grades. They have such power to do so much good (and also in some cases, to screw you up).